You have the option of using our Free Studio22 Album Maker software or to submit your own design using Photoshop (or Lightroom, Illustrator, InDesign, iPhoto, PageDeisgn, Aperture etc). 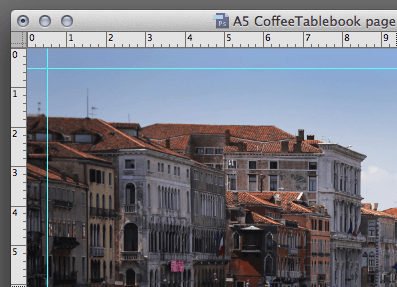 For individual pages, we provide basic PSD templates to show the page dimensions, with guidelines. For the covers, we allow additional space for the guidelines to show where the image wraps over the edge of the cover. Please Supply Coffee Table Book pages in one PDF format as individual pages with a separate cover (cover in Jpeg) using our templates (place your images behind the template, we need our guidelines to show). Supply a contact sheet/s with all images in sequence and with page numbers showing. Roughly 6×6 images (36) per A4 sheet (210x297mm). Please add a stroke or drop shadow to define the individual page edges. (If you need a contact sheet created on your behalf, please request a quote, rates start at R65/10 minutes of artwork). If artwork is not provided as per the above guidelines, it will be sent to the design department to be updated in the correct format at R65/10 minutes. If you need this to change, please notify us in writing with your order. Please do not change the page size by adding “bleed”. Please see “Safe Area” note below. 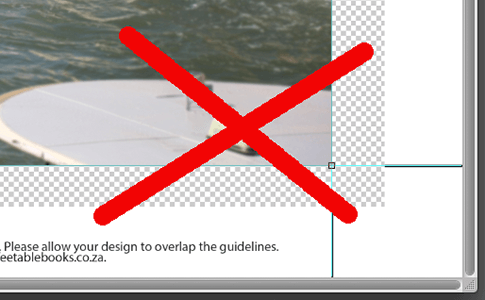 Guidelines on individual pages should not be treated as cut lines (Please do not change page sizes or add crop marks to the pages). Avoid placing small, detailed images or text close to the edge of the page or guideline. 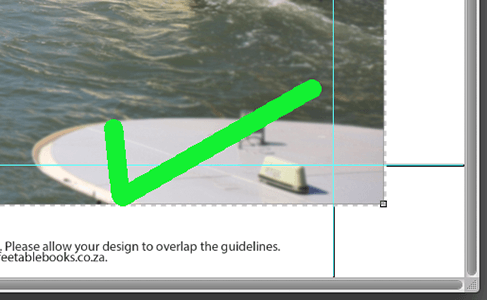 Our recommendation is to allow the image to overlap the page edge and guideline (see example 1 below), or stay within the guideline with ‘breathing space’ away from the page edge (see example 2 below). If colour correction is required, we would need the files submitted prior to layout. We are not able to offer colour correction to pages that are already designed – once submitted, files are printed as “Print-Ready”, without any alternation. If work is required by one of our designers prior to printing, our standard hourly design fee will apply. Click here for our dedicated template page and select the appropriate templates for your product of choice. 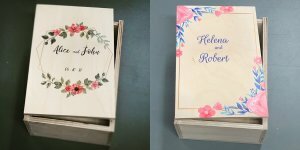 You will find templates for all our photo books, PresentAccordions, DVD cases, Presentation boxes and more. We welcome design from other software too. 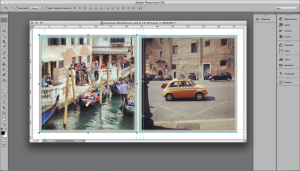 If you are able to produce JPeg or PDF files at full photographic resolution to our page dimensions, we will be able to print and bind books for you. 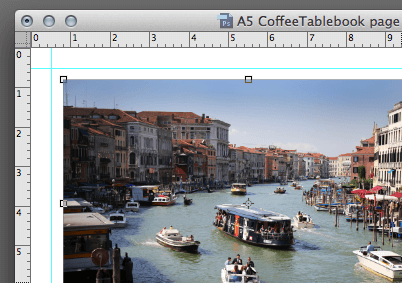 Examples: Lightroom, Illustrator, InDesign, iPhoto, PageDeisgn or Aperture (software not supplied). Additional fees may apply if alterations or customs books are needed – please see our submission requirements above. When will my book be ready? All CoffeeTableBook.co.za products follow a 7 working day cycle. Your deadline will be confirmed via e-mail, or in-store, once it is booked into production. If the production team are at capacity, this time may need to be reassessed. Printing only begins once the payment notice has been received. Urgent orders will incur an express fee.